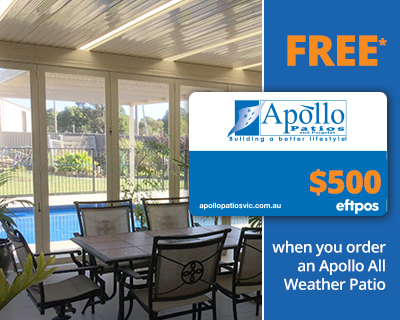 The term ‘APOLLO PATIOS VICTORIA Pty Ltd’ or ‘us’ or ‘our’ or ‘we’ refers to APOLLO PATIOS VICTORIA Pty Ltd, the owner of the website, whose registered office is 35 109 171 280, Victoria. The term ‘you’ or ‘your’ refers to the website user. You hereby indemnify us and undertake to keep us indemnified against any losses, damages, costs, liabilities and expenses (including without limitation legal expenses and any amounts paid by us to a third party in settlement of a claim or dispute on the advice of us legal advisers) incurred or suffered by us arising out of any breach by you of any provision of these terms and conditions, or arising out of any claim that you have breached any provision of these terms and conditions.